Toast, New American Gastropub, located in the Village shopping center, was the first restaurant venture from Jessica and Josh Bufford. Opening its doors in August 2012, Toast quickly became a neighborhood hotspot and dining destination. 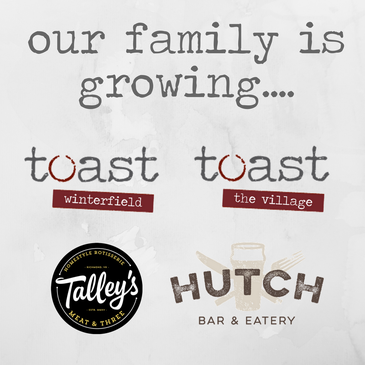 With the opening of Toast’s second location at Winterfield, Jessica and Josh are excited to bring the Toast experience to the Southside! Toast’s menu boasts of cuisine inspired by southern classics with a twist, with a wide variety and selection. The restaurant is happy to accommodate most allergy needs and offer a large gluten free menu as well.